Cd contains also the 9 tracks of the first album.Value for money. The band started as a side project of The Oppressed. Paul was writing several song's regarding today social climate and the rise of the far right in Europe as Brexit and Immigration was all over the media. The songs had a positive response from Roddy and Kizmus, they both encouraged me to continue writing and Fatal Blow started taking shape as a band in it's own right. As much as we love Oi! There seemed to be a theme of drinking, football and working-class pride in a lot of bands song's, I feel this has been done to death and for me never had a message. However, bands like the Upstarts, Ruts and The Oppressed and similar bands had great song's that also put over a message about society, government, fascism etc. When Roddy knocked it on the head with The Oppressed due to ill health, we decided to get a permanent bass player in and do the band full time. Nidge stepped in on bass and we started writing and rehearsing ready for the next step of releasing a new album and getting the band out on the live circuit. 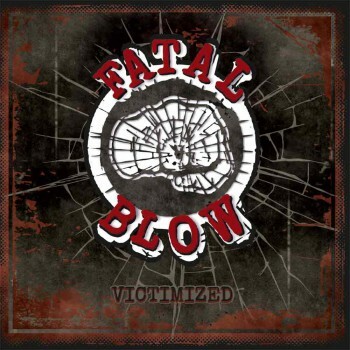 The result is the new album “Victimized” We are very proud of what we have achieved. We are all very happy with the result which has captured the band at this period. We have a great line up and the new songs have been written as a band.